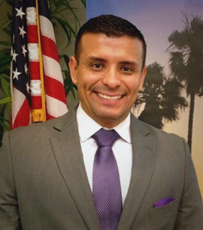 Alejandro Espinoza is the Program Officer and Outreach Director for the Desert Healthcare District/Foundation and a faculty member at California State University, Fullerton, where he teaches Community Health Education. He previously served as a Program Director of chronic diseases and special projects at Latino Health Access (LHA) in Santa Ana, CA. His tenure at LHA provided him the opportunity work along-side community-based organizations throughout the country assisting in the design and implementation of programs and services utilizing the community health worker (Promotora) model. Alejandro has also collaborated with academic institutions, public and private organizations, and community-based organizations in their efforts to conduct focus groups, pilot research programs and community forums within the Latino community. He serves in multiple committees’ and sits on various governing boards providing his expertise and knowledge of community-based participatory research and the utilization of the community health worker (Promotora) model within under-served communities.